A rare sewing venture | spifftacular. Last night, instead of packing for a trip I’ll soon be taking (one that involves Disneyland and a returning missionary! ), I stayed up until 1:30 a.m. sewing, working on a handful of alterations I’ve been meaning to do. Although late-night crafting is totally my idea of a fun time, late-night (or anytime) sewing generally is not. It always seems to end in a clustercuss of pin injuries, knotted thread, and a well-meaning project gone terribly wrong (or at least off-kilter). Alas, my relationship with my sewing machine did not dramatically alter (pun intended!) during this venture, but I am glad that I neglected my packing duties in favor of sewing. I am usually most inspired and motivated when it is late and/or when I am procrastinating something else, and lately I’ve been wanting to give sewing another go. I’ve always admired people who are passionate about sewing and have recently been loving Charlotte’s blog The Creative Domestic and another sewing-centric blog, While She Naps, so when the mood to create something hit me, sewing was the answer. Frustrating though it was at times, in the end I feel satisfied. What I have to show for my efforts: two pairs of shorts that now actually fit my waist, and a new skirt. Sorry, this won’t be a tutorial–I’ll leave that to the experts–but basically for the shorts I very loosely interpreted this tutorial and just took in one side, and for the skirt I did a lot of seam-ripping and trial and error. The shorts I already had on hand. 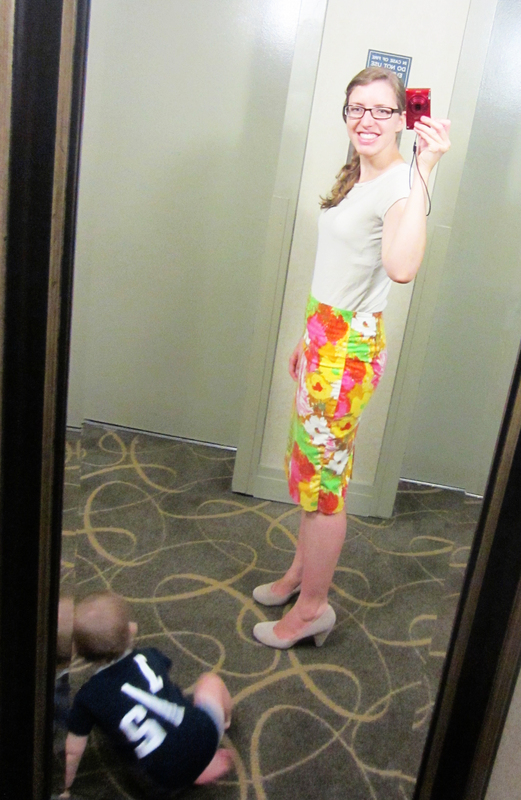 The skirt was a Goodwill find, originally from Talbots. I loved the fabric, which was a near exact replica of some bedsheets I remember at my grandparents’ very-’70s house (they had avocado shag carpet until the 2000s). It was a size 16, but I figured at only a few bucks it was worth a try to take it in. The seams aren’t the smoothest, but they’re smooth enough, and now it fits me as well as, if not better than, any pencil skirt I could buy. I’ll call it bumpy bespoke. And now, I have three “new” pieces to bring on the trip. Turns out I was packing after all. Does anyone else like to postpone packing or other chores by pursuing sudden creative/organizing/cleaning projects? Also, would anyone like to share tips on entertaining a one-year-old on a cross-country plane trip?